Hello, welcome to any new volunteers who have joined us from Dairygold Make a Minute campaign- encouraging people to use an extra minute to make a difference. What better way is there to use a spare minute than to make a seriously ill child or sibling smile? Its simple, just choose a child from our site and send them a cheerful message! Friendly emails are nice but nothing beats getting a happy card in the post does it? If you are a business or community group you could hold a day/lunch hour where you get everyone volunteering. The Discovery channel have done this for the past 2 years. We ask you don’t expect a reply as the children are very unwell and their parents are busy looking after them but if you join our Facebook Official group you might just see the child smiling with your post! If you are stuck for what to say we have a helpful guide here, and if you aren’t sure what to send then what about a postcard from where you live? All our children have recently been given a lanyard to collect pins and badges on so they would go down well too! We pride ourselves on asking people just for their time rather than their cash but we do rely on donation to keep our work going- not to pay salaries or expenses (we are 100% volunteer run from home) but so we can send TLC parcels, make finger print necklaces for the mothers of terminally ill children, provide an annual party, take the families away for a fun weekend every 18 months etc etc. If a business or charity would like to sponsor a project we can work with you to find the right one for you, 100% of the money will be used on the project and we will feed back pictures and responses from families. 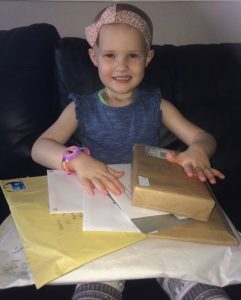 If you are in any doubt as to how using your extra few minutes to send a card can help a terminally ill child then please read how it helped Ebonie who has sadly since passed away. Thank you for Making a Minute for Post Pals!